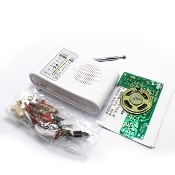 *This CF210SP AM/FM Stereo Radio Kit is a DIY item, requires you to solder it yourself. *Using unique FM AM two-band radio technology, reliable and stable. *Adopts TDA2822 amplifier circuit, good sound quality and high performance. *A perfect project for the electronic enthusiast and leaner. *Easy to solder and use. *Simple circuit, better selectivity and the assembly of high success rate.